Factual error: When the convictions are overturned, the defendants' solicitor, Gareth Pearce (played by Emma Thompson) is shown arguing their case in court. In England solicitors cannot appear in the higher courts, and in fact a barrister presented the case. However, the film is 'dramatically correct' because it was Gareth Pearce who got them freed, and the barrister in question is far too full of herself without having the honour of being portrayed by Emma T.
Continuity mistake: At the end of the trial, when he goes out of the tribunal, Daniel Day-Lewis has a different shirt - a different tone of green. Factual error: The film is supposed to be set in 1972/73 yet when you see street scenes some of the vehicles are cars from the mid to late 1970's. Trivia: The Maguire Seven & The Guildford Four were shown in the film as being tried at the same time, when in fact they were tried separately. 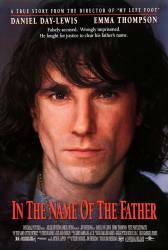 Trivia: Although Pete Postlethwaite plays Daniel Day-Lewis' father in this film, he was only 11 years older than Day-Lewis. Gerry Conlon: What I remember most about my childhood is holding your hand. My wee hand in your big hand, and the smell of tobacco. I remember, I could smell the tobacco in the palm of your hand. When I want to feel happy, I try to remember the smell of tobacco. Giuseppe Conlon: Hold my hand. Gerry Conlon: When can I go back to Belfast? Detective: Next time you'll see Belfast, they'll be flying day trips to the moon. Gerry Conlon: I always wanted to be an astronaut. Gerry Conlon: That was a good day's work, McAndrew. A good day's work. Joe McAndrew: Get away from me. Gerry Conlon: You're not looking me in the eye when you're speaking to me. You see, I know how to look at people without blinking as well. In all my god-forsaken life I have never known what it was like to want to kill somebody until now. You're a brave man, Joe. A brave man.